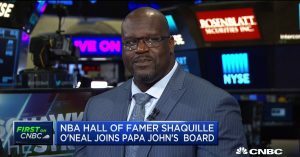 SARA EISEN: Welcome back to “Squawk on the Street.” Papa John’s Pizza announcing this morning that NBA Hall of Famer and Restaurant Investor Shaquille O’Neal will be joining Papa John’s board. He will also be investing in nine restaurants in Atlanta. Shaq is also signing on as an ambassador for the company. 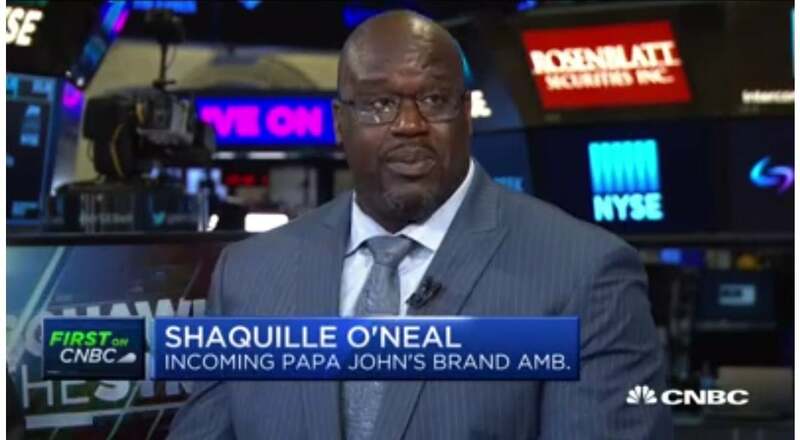 Joining us now, Papa John’s CEO Steve Ritchie, Starboard Value CEO and Papa John’s Chairman Jeffrey Smith, and the new incoming board member and brand ambassador Shaquille O’Neal. Welcome. Good morning, gentlemen. SHAQUILLE O’NEAL: How are you? SHAQUILLE O’NEAL: Yes. When I met with Jeff and Steve and talked about diversifying the leadership role and they wanted me to become the first African-American on the board. And I thought it was great, because you know, everyone loves pizza and pizza loves everyone. Papa John’s was created in ’84. I fell in love with Papa John in 1989 in Baton Rouge, Louisiana. So, you know, it is a great opportunity. You know, we want to create a culture there now where people are loved, welcomed and accepted. We don’t want to have any problems. And listen, pizza is fun. Everyone knows Shaquille O’Neal, they know that I’m in the fun business. And we want to get this thing back on track. JEFFREY SMITH: Yeah, Carl, the pizza is great, the food is great, the quality is fantastic — it is the best in the space. But you’re right, it is both opportunities. So, we have an opportunity to improve the operations and the marketing. Shaquille is a great partner for both of those. He is a natural leader and a natural marketer. I’ve been incredibly expressed with his creativity, but he is also an owner and operator of restaurants. So, he’s going to be a real value enhancer on the board. I’m very excited about, not only Shaquille but we’ve added five new board members in the last few months and Shaquille is going to be a great addition. 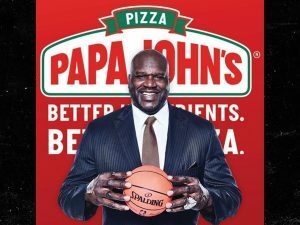 SHAQUILLE O’NEAL: Yeah, because I always wanted to be a franchisee. And we talked about a lot of things. So, for me, this is a triple threat: board member, franchisee and ambassador. Because again, everyone loves pizza and pizza loves everyone. SARA EISEN: You know, part of the scandal around the company’s founder had to do with the fact that he used the “N” word on a conference call. Do you think that ultimately impacted the reputation of Papa John’s in the African-American community and the sales numbers? SHAQUILLE O’NEAL: It probably did. And let me be on the record saying that is not acceptable. But now we have new leadership. And these two gentlemen, first thing when we met, first thing they talked about was you know, diversifying leadership roles. And you know, we talked about helping the African-American community. They just did a big deal with the Boys and Girls Club. So, they are really into the community. As I think about what went on, I worry about the 800 franchisees because they did nothing wrong. You know, they are your neighbors, they are my neighbors, they are regular people that do the right thing and they were very affected. We have 120,000 team members. I want to be the one to help get everybody back on track. But this is the new — this is the new hierarchy right now. SHAQUILLE O’NEAL: No, it’s not going to be Papa Shaq. SHAQUILLE O’NEAL: No, it’s not going to be Papa Shaq. However, I will be introducing Shaq-Aroni. 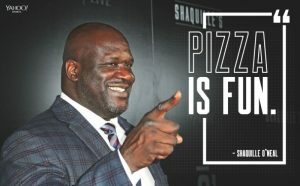 SHAQUILLE O’NEAL: Shaq-Aroni pizza: extra big-sized sausage, big extra pepperoni, extra cheese, so. SHAQUILLE O’NEAL: Yeah. You’re the first one. SHAQUILLE O’NEAL: I like the word. SHAQUILLE O’NEAL: Priority number one. I’m very happy about the nine stores that I will be obtaining in the Atlanta market. I’m very happy about partnering up with Papa John’s. And I’m also very happy about helping these guys create a culture where everybody is loved, welcomed and respected. SHAQUILLE O’NEAL: That is something that we’ll be talking about. We’ll be talking about a lot of new innovative things. I just want people to understand that image is reality. And the reality is we have new leadership and I’m confident these guys will bring Papa John’s back to where it used to be. And you know, we just want to promote fun, we want promote great healthy ingredients like we’ve always been doing and I’ve been involved with Papa John’s since 1989. So, I’m happy to be here. 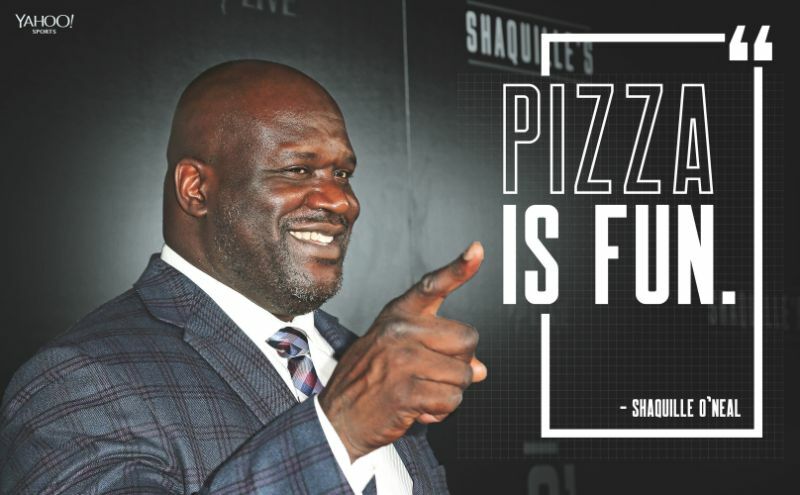 SHAQUILLE O’NEAL: As a customer, yes. SHAQUILLE O’NEAL: Well I learned, being a franchisee, being a manager, the one thing I never did was micromanage my people. And I know and understand customer service. If the customer is not happy, they don’t like the food, we’re not doing something right. So I always try to focus on customer service, what the people like, what the people want. And if you do that, and you still put out a great product, everything should go like you want to go. SHAQUILLE O’NEAL: I do, but I would get trouble if I start talking about what I trade. SHAQUILLE O’NEAL: Yeah, mm said ‘Keep to yourself,’ because the way it was portrayed on TV, like I was showing off. So, to answer your question, I’m in. I’m always in. SHAQUILLE O’NEAL: Whatever you got, I got. Put it that way. SHAQUILLE O’NEAL: It does because it is all about fun. I realize that if you make people laugh, it releases endorphins in their face and hopefully what that does is relieve stress. When you think of Shaquille O’Neal, I want you to think of a nice guy ,a funny guy that makes me laugh. As I look at everybody here, this is a real job, a stressful job. I want to be the one guy to make you laugh and make you forget about all your stressors so you can enjoy your day. SARA EISEN: Maybe one of those stocks you are in– maybe Jeff has got you into Bristol-Myers? Jeff, which we should talk about now. Last time you were on with David, you weren’t able to. You’ve been pretty public now. JEFFREY SMITH: Right. 200 pages. We met with ISS. We met with Glass Lewis. There is a couple of key points here. First, Bristol-Myers is a great company standalone. It is a growing business. It doesn’t need to do anything. There is some fear out there that if Bristol-Myers doesn’t buy Celgene, then what is next? What is next is you have a great company with a lot of options to expand its business. It is a growing business standalone, it’s an extremely profitable business, it has no debt standalone, about produce $37 billion of cash over the next couple of years. There is a lot of flexibilities. They don’t need to do any deal and they certainly don’t need to do this deal. As it relates Celgene deal, we just think it is too risky. They are paying a very large price which includes, when you break down the numbers, about 30 billion for the pipeline. And in order to make that work, based on our presentation, that means that Celgene needs to be successful with coming out with about ten new blockbuster drugs in the next eight years. That is just really difficult for us to imagine actually happening. Drugs are very difficult to predict. What was it — yesterday we had one that didn’t make it. But people are excited about drugs coming out people believe they will work. People are optimistic. We all are as individuals excited about drugs coming out and hope they work for the benefit of all of us as people. But sometimes they don’t. And buying into Celgene because you believe that ten blockbuster – blockbuster, not just ten drugs, but ten blockbusters will come out in the eight years is a lot of risk. You start missing one or two even, you could be destroying billions of dollars in value and Celgene over the last 15 years came out with three blockbuster drugs. JEFFREY SMITH: We are not short Celgene. We don’t talk about our trade — I can’t talk about what we’re doing for years and years and years. We are not short Celgene. We’re not advocating on that side. But we are Bristol-Myers shareholders and looking out for what’s in the best interest of Bristol-Myers. SARA EISEN: What about basketball, Shaq? Zion Williamson plays his first playoff game today. Everybody says that he is the most physically dominant player since Shaquille O’Neal. Is that true? SHAQUILLE O’NEAL: He is a great young player. Very gifted. I wish him well. There’s a lot of speculation that he may leave school after this to join the NBA. My advice to him is take as much time as you want. Have fun. Especially in college. This will be the best years of your life. Once you become a professional, it is a different ball game. You have to learn words and terms that you know nothing about. Like the first word to me was FICA. FICA, yeah. Because I got a check for $1 million and FICA took so much money I had to ask my guy like ‘Excuse me, brother, who is FICA?’ So Zion, watch out for FICA. He’s coming for your money. SHAQUILLE O’NEAL: I saw that and I was saying to myself he’s a very powerful guy. Nike – they’ve always been at the top. I don’t want to talk about the Nike brand. My thoughts are this guy is very powerful because he was using with all that force and when he stopped, he kept going and he just ripped the shoe. SHAQUILLE O’NEAL: Never. Stop it. According to Basketball Reference, Shaquille O’Neal earned a staggering $292 million during his NBA career — but, he also made a whole lot of wise financial decisions. He may be retired, but Shaq is still one of the richest players of all time. The Diesel is widely regarded as one of the best basketball entrepreneurs, with a net worth of $400 million. He recently got his doctorate degree, so make sure to call him Dr. Shaq. Here are Shaquille O’Neal’s most successful business ventures. Five Guys — Many people know that Shaquille O’Neal owns Five Guys franchises, but did you know that the man owns 155 locations? Fitness Franchise — The Diesel owns 40 24 Hour Fitness locations and he made sure to tailor all of the locations according to his standards. Google — Although we’re not sure how he got in as a Google investor before the company went public, he did. As anyone can plainly see, this was definitely a smart business decision. Before Google went public in 2004, the company’s stock traded at $85 per share. Now, one share of Google stock stands at $1,165.93. It’s safe to say Shaq differentiated his portfolio quite well as he also invested in Loyal3, a San Francisco startup that revolves around giving individuals IPO access. Real Estate — Shaq has ventures in both residential and commercial properties. In 2006, he invested in The Met Miami, a residential high rise that has more than 1,000 units. In addition to residential buildings, Shaq is a part owner of a few nightclubs in Vegas. He also invested in Newark, New Jersey properties including CityPlex12, a theater that O’Neal bought and renovated and is now very profitable. Newark is his hometown so it only makes sense he’s investing back into the community. Shaq has an endorsement deal with The General auto insurance company, which currently sells insurance in 44 U.S. states. Other Food related revenues — Shaq makes about $20 million from other food-related endorsement deals like Fruity Pebbles, Muscle Milk, Vitamin Water, and Arizona Cream Soda just to name few. Other notable ventures and endorsements: 150 car washes, 17 Auntie Anne’s Pretzels, Buick endorsement, Icy Hot endorsement, Burger Kind endorsement, let’s not forget the Reebok endorsement and many, many more. Shaquille Rashaun “Shaq” O’Neal, is an American retired professional basketball player who is a sports analyst on the television program Inside the NBA on TNT. He is widely considered one of the greatest players in the history of the National Basketball Association (NBA). At 7 ft 1 in (2.16 m) tall and 325 pounds (147 kg), he was one of the tallest and heaviest players in the history of the NBA. O’Neal played for six teams throughout his 19-year career. Following his time at Louisiana State University, O’Neal was drafted by the Orlando Magic with the first overall pick in the 1992 NBA draft. He quickly became one of the best centers in the league, winning Rookie of the Year in 1992–93 and leading his team to the 1995 NBA Finals. After four years with the Magic, O’Neal signed as a free agent with the Los Angeles Lakers. They won three consecutive championships in 2000, 2001, and 2002. Amid tension between O’Neal and Kobe Bryant, O’Neal was traded to the Miami Heat in 2004, and his fourth NBA championship followed in 2006. Midway through the 2007–2008 season he was traded to the Phoenix Suns. After a season-and-a-half with the Suns, O’Neal was traded to the Cleveland Cavaliers in the 2009–10 season. O’Neal played for the Boston Celtics in the 2010–11 season before retiring. O’Neal’s individual accolades include the 1999–2000 MVP award, the 1992–93 NBA Rookie of the Year award, 15 All-Star game selections, three All-Star Game MVP awards, three Finals MVP awards, two scoring titles, 14 All-NBA team selections, and three NBA All-Defensive Team selections. He is one of only three players to win NBA MVP, All-Star game MVP and Finals MVP awards in the same year (2000); the other players are Willis Reed in 1970 and Michael Jordan in 1996 and 1998. He ranks 8th all-time in points scored, 6th in field goals, 15th in rebounds, and 8th in blocks. Largely due to his ability to dunk the basketball, O’Neal also ranks third all-time in field goal percentage (58.2%). O’Neal was elected into the Naismith Memorial Basketball Hall of Fame in 2016. He was elected to the FIBA Hall of Fame in 2017. In addition to his basketball career, O’Neal has released four rap albums, with his first, Shaq Diesel, going platinum. He has appeared in numerous films and has starred in his own reality shows, Shaq’s Big Challenge and Shaq Vs.. He hosts The Big Podcast with Shaq. He is also the general manager of Kings Guard Gaming of the NBA 2K League. GOOD LUCK WITH THE PAPA JOHN’S EXPERIMENT, SHAQ!!! BRETT FARVE, WILL HE BE BACK?